I like pretty much every food in every food group. Except prunes. There’s something about their texture and appearance that I’ve disliked since my childhood. Even Devils on horseback I don’t like (actually especially Devils on horseback). 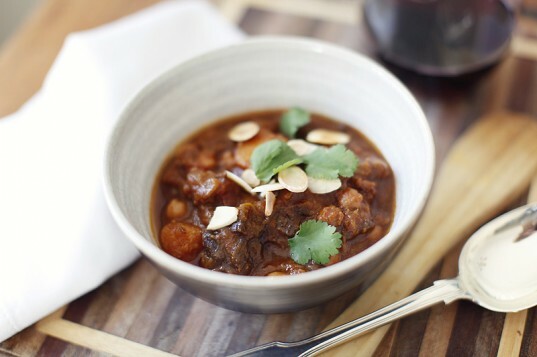 But last night I found this great beef tagine recipe (with prunes) which looked great. So I looked past my prune prejudice, and decided to make it. And it was delicious. The prunes added a beautiful sweetness to the dish – without tasting too pruney. If that makes sense. So I might not be ready for devils on horseback, but I can eat prunes now without the gag reflex kicking in. (Sorry – that’s probably an unnecessary bad visual). It’s a Jamie Oliver recipe, again from that same little book I have – where the amazing lamb recipe came from. The recipe calls for a spice mix that you rub all over the meat, then let it sit for a couple of hours or overnight. I actually was running very short on time, and didn’t have a chance to let it sit. I thought it was still great – although if you left it for hours it would no doubt improve the flavours. I will definitely be trying this again – with the correct marinating time. It was pretty quick to prepare – probably about half an hour of chopping and getting organised. Serves about 4 – 6 people. 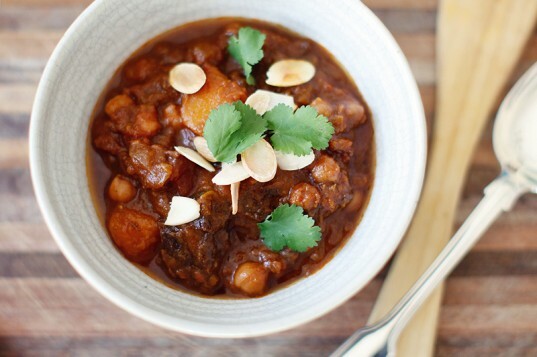 Could give it a go with the kids – it’s spicy but not hot spicy. Make the spice rub: get all the ingredients for the spice rub out, and combine them all together in a small bowl. Prepare the beef: put the beef into a large bowl, then pour over the spice rub and massage it all in with your hands. Make sure it’s evenly covered over all the meat. Then if you are organised, wrap the bowl in clingwrap and put it in the fridge for a couple of hours, or overnight. If you are like me and are starting this dish at 3pm, just rub it all in and let it sit for as long as you can in the fridge. I reckon mine was in there for no more than 15 minutes. Jamie recommends overnight ideally. Cooking: when you’re ready to start, get your big heavy saucepan/casserole pot out, heat it up and add a decent slug of olive oil. Fry the meat for about 5 minutes, over a medium heat. Then add the chopped onion, and some very finely chopped stalks from the coriander. (I think coriander stalks are one of the best smells around). Fry for about another 5 minutes. Then put the tin of tomatoes and chickpeas in, pour over 400ml of the stock and give it a good stir. Bring to the boil, then put the lid on (or cover with foil) and reduce to a simmer for 1.5 hours. It’s prune time: after 1.5 hours of cooking, it’s time to add the prunes, the pumpkin and the rest of the stock. Gently stir everything around, then put the lid back on and continue the cooking process for about another 1.5 – 2 hours. Keep an eye on it – if it looks too dry then add a little bit of water. Mine seemed to be ok – I added a tiny bit towards the end of the 2 hour mark. Time’s up: take the lid off and check it all out. If you think it’s too runny, then simmer for another 5 – 10 minutes with the lid off to thicken it up a bit. Mine didn’t need it. The meat should be really tender, and flaking apart. Taste it – check it for seasoning. Serving: either serve it up in the casserole dish, or dish it out – whatever you prefer. Add the toasted almonds over the top, and chopped coriander. Serve with rice and feel the winter goodness.